Are You Excited To Experience Comfortable & Natural VR?! Virtual Reality doesn't feel real if your headset is uncomfortable or painful... That's why OPTIC uses a virtual reality technology that includes SUPER SOFT & COMFORTABLE leather straps that support your eyes as well as a design that fits naturally around your face! With this Ultra Comfortable Experience, you might forget you're wearing your VR Glasses! You'll Easily Focus Your Invisible Lenses In Seconds You could spend hours trying to focus the lenses of other Virtual Reality goggles...and you may still never get it 'Just Right' Your friends at OPTIC care about your priceless time! You can adjust your VR lenses in as little as 10 seconds to avoid eye strain! And with a COMPLETE 360 view, you'll feel like part of your video or movie! You Can Finally See Breathtaking 3D VR That FEELS REAL! Other VR Headset brands think that a 100 degree field of view is a 360 degrees FOV... But you know that's not true. If you want a REALISTIC 3D VR Experience that takes your breath away, you need the best quality virtual reality system! OPTIC Is That System, with a complete field of view taken up by your amazing VR view! What Makes OPTIC The Best?! Super Comfortable foam inserts! Fits Naturally! Eliminates neck & eye strain! Fast & Easy lens focusing! Light as a feather! Compatible with iPhone | Android | IOS | Samsung | LG | HTC & More! OPTIC Believes You Deserve The BEST! If You're Ready to experience the most natural, comfortable, easy & breathtaking 3D Virtual Reality, Click Add To Cart NOW! But HURRY! This low price is Limited...So Take Advantage of this Deal Before It's Too Late! 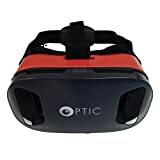 Optic VR Headset is the world's leading VR box brand which has the most creative and innovative ideas. We are committed to provide the best immersion experience and the excellent ergonomics comfortable VR box products. Now, just enjoy a full theater-quality experience for games and movies with the lightweight, versatile Optic Virtual Reality Headset. With world-first technology that allows gaming and movies to be watched in the same headset, your experience with our product Optic VR Headset will be unlike any other. For a better experience for the game playing with Optic VR Headset, we recommend that you had better purchase a Bluetooth remote controller online fits your smartphones, which will definitely fit the Optic VR Headset. EXPANSIVE VISION, ADJUSTABILITY AND USE The Optic Virtual Reality Headset offers more immersive movie viewing and game playing than any other headset. With a larger viewing angle of FOV102 ° and 5.2 times magnification, our headset smashes the competition. The Optic VR Headset is more powerful, more comfortable, and more amazing than anything else out there; do yourself a favor and get the best tech gift of 2016! 100% Satisfaction Guaranteed for 15 days after purchase date.Just request a return from amazon. Buyer responsible for postage.